Carol Barrett and Lesley Channon have been forced by an accident to postpone their planned Long Ride in southern England. "We are riding from Bath in Somerset to Eastbourne in East Sussex, and back again - a round trip of about 400 miles, give or take a few. Lesley owns and rides a 14.2 hand coloured Irish cob, Paddy, which she described as "one of the sweetest cobs that ever walked the earth." Carol has a 15.3 hand chestnut Arab named Rupert. "Rupert is an ex-endurance horse who thinks he's TERRIBLY superior, especially to Paddy, except when there is something scary on the road, in which case he'll send Paddy in first and hide behind him," Carol told The Long Riders' Guild. 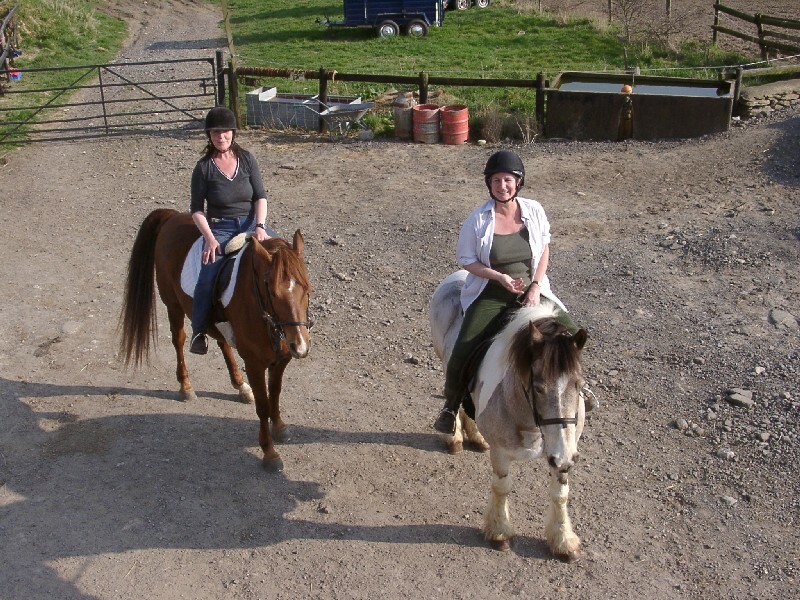 "We are doing it in memory of a friend and fellow rider, Judy Weller, who sadly died from cancer last year, and to raise money for the wonderful hospice who cared for her, Dorothy House. In addition, we would like to establish a route for other riders who want to ride long distances in England, whether it be for training purposes, charity, or a holiday on horse back. The south downs way is obviously an established trail, but our route from Bath to the start of it east of Winchester has, to date, involved surprising little road work. We have been overwhelmed at times with the enthusiasm and help we have had from everybody in setting up our ride. Not least from those on who we have 'cold called' in our attempt to find B&B for us and our horses. The ease in locating B&B might be partly because we are riding for charity and partly because we are, in a small way, being pioneers on behalf of the many riders in this country. There are plenty of livery yards, private stables and riding stables throughout the country who, if approached, might well be willing to put up a limited number of riders and horses for a night, especially during the summer months when there might be stables vacant and/or the grazing good. It would be beneficial to all to set up a network. And if we can do it in Judy's name all the better. The Judy Rides maybe? Of course we have, Carol. That's why we're Long Riders! "We were going like the clappers, and had covered just over 100 miles in four days. On the fourth day we got onto the South Downs Way, we then only had to ride another four miles or so to get to our next stop after halting for a photo-shoot. Off we trolled, in high spirits, it was a beautiful early evening, the going was lovely and we were feeling really pleased with Paddy and Rupert, who had coped with the whole thing brilliantly. We reached our overnight stop, which is where I made the fatal mistake of riding into the yard. Rupert started to get twitchy, and I actually said to Lesley “I think I should get off now”. She didn’t hear me, being some way ahead, so I thought “what the heck” and stayed on. We rode up the drive and round the corner. The yard was quite a mess, due to building work in progress, stacks of bricks and sand, old caravans and clapped out cars etc etc. A peacock suddenly jumped up onto a nearby stable roof, and Rupert was instantly on his toes. Lesley had pulled Paddy up, and as I stopped next to her I thought it would be a good idea to get off NOW. As I dismounted (and the next it is like a bad dream) a small spotty pig came ambling round the corner. Rupert said (in horsey tones) “Pigs!!!!! Run!!!" And went to bolt. I tried to grab his reins a bit tighter, and turned his back on me and kicked out, catching me smack on my left kneecap. I collapsed on the ground in agony, and as Rupert took off back down the drive Paddy, with Lesley still on board, decided to take off too. Straight over my kicked leg. GAAAAAGH!!! I lay on the ground doing Drama Queen, in the middle of which I tore off my riding hat. When I came to my senses a minute later, I looked over to see small spotty piggy culprit legging it off round corner WITH MY RIDING HAT IN ITS MOUTH!!! To cut a long story short, I spent the night at Winchester A and E, nothing broken but badly damaged ligaments in the knee, which are going to take about two months to heal. No riding. No Long Ride until next year, as we have missed the window for the long daylight hours. Riding hat has small piggy toothmarks all round the rim. Am marooned at home watching daytime T.V. until I go barking mad and start chewing the sofa. (If you need to know anything about gardening, antiques or home decorating, I’m your girl). So there we are. Lesson learnt, never ever ride your horse into a strange yard. Hopefully we'll complete the ride next year, I can’t WAIT to ride again. The riding we did before the accident was awesome, Salisbury Plain in particular. We couldn’t push the horses on too fast as the weather was really hot, but they coped with the different terrains and changes of yard so well, and we are so proud of them both." Bad luck, Carol - we sympathise. Your experience just goes to show that ANYTHING can happen on a Long Ride, even in the most civilized places. And for the pig to run off with your hat...... Sorry, but we had to laugh at that one! We hope your ligaments mend soon, and that you can make your Long Ride next summer.